Even though I think I've covered this subject to the point everyone is bored with it, I still get questions — a lot of questions. So, I'm doing a four part series calling out the steps I take to "winterize" the garden. Today is Part One: moving the non-hardy plants into the basement, this happened last Tuesday and Wednesday, Oct 3 and 4. Some people fixate on the "non-hardy" part and figure I'm taking them in because a freeze is eminent, that's not the case. Temperature wise they'd be fine outside for another month or more, but eventually they have to come inside and it's much easier to do it when they're not soaking wet (the longer I wait, the more it rains), plus it's better for their long term health to come in on the drier side. Here's the set-up in the basement, pre-plant invasion. The assortment of things on the table are to add height to the back row of plants, all the better to see them and for them to get the most light possible. The stack of metal circles in the lower right are platforms on wheels, for the especially large and heavy things. Here's how things are looking after about 4 hours of work. It's not just picking up the plants and hauling them indoors, I stop on the way and give them a once-over, looking for slugs and bugs and just generally cleaning them up. Unfortunately I still found mealybugs, despite my having treated for them. But, there are not as many as last year, and they're only on the Agaves. I'm afraid they're not ever really going away. Management. It's all about management. Yes that's the washer and dryer visible in the background. And now here are things at the end of day two, after two more hours of work for a total of six. I'm rather amazed at the size this Agave desmettiana 'Variegata', and to think it used to set on my desk at work! Also impressive are the size of these Pachypodium lamerei, purchased as small 4" pots. 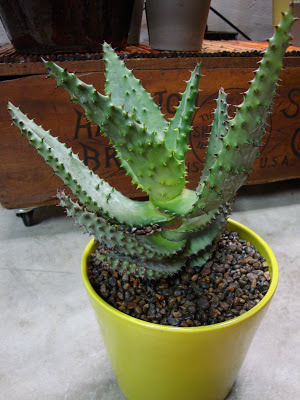 Ditto for my Aloe marlothii, although it was bought in a gallon size pot. Most of these containers are waiting for the next step of winterization: building the shade pavilion greenhouse. The plastic walls go up and the plants go in. That won't happen for another couple of weeks or so, last year it happened on Oct 22. Then the next step (which may happen sooner, it's temperature driven) is to bring inside the Bromeliads and Tillandsia. 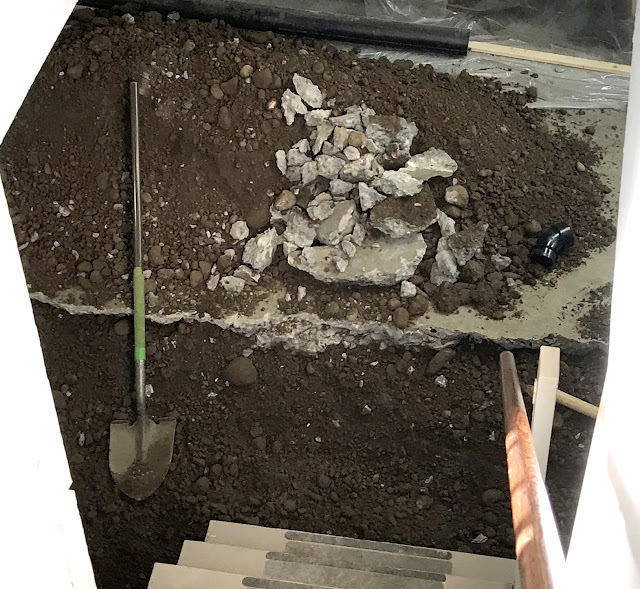 Soil and rocks, in my basement (!) — we're getting a half bath put in — those are the basement stairs barely visible at the bottom of the photo....hopefully Mother Nature will be good to me and keep our temperatures reasonable for a few weeks. I am glad for this 4 part series as I'm a late comer to your blog. 86 pots is an astonishing number! Pachypodium lamerei is absolutely magnificent. I hope you were wearing protective gear. I know Agaves are famous for being drought tolerant, but they do need water sometimes, so how does that Agave desmettiana get watered? It looks like it must be a struggle to get water to it, given how much surface of the pot it covers. Or is it always bottom-watered? I've tried to repot all my Agaves off-center into wide pots, because I put one of my first into as tall narrow pot, and now it dries out and shrivels unless I stick it in a dishpan full of water every so often. I think I'm going to have to sledge-hammer the pot to get it out eventually. By the way, that Agave is gorgeous! It's facing the camera in all those shots, if I took a photo from it's bad side you would see it's tipped a little to one side. Not so much because I planted it that way, but because it's been at the front of the house and it's naturally grown towards the sun. Not only does that give space for it to take up water, but it makes it "easier" to carry into the house too. That's a beautiful agave cream spike. I'm with you, most of bringing plants in / preparing for winter has less to do with frosts and more to do with drying off. Oh plenty of what I need to do deals with frosts, it's just the first few things that are "dry" issues. This is beyond incredible from my point of view. I have 5 pots outside and feel overwhelmed at that silly amount. Four of them will have the plants put in the ground outside until next spring. The fancy Pelargonium will come indoors but i need to buy new potting soil. Not because the plant needs it but I don't want to take a chance of bringing in any jumping worm larvae which are the size of poppy seeds. The few potted plants I've dealt with had worms in them when I pulled the plants out. I simply can't imagine dealing with your volume of potted plants. Makes me feel like a lazy gardener, esp. as your garden always looks so pristine. Five! Ha. I can do five in my sleep... (sorry, I couldn't resist...I know that sounds like playground talk). So many agave types! It makes me green with envy! Unlike you I am getting ready for summer.. winter is warm and short here but summer is long and harsh and I am very stubborn about growing temperate climate plants.. summer is my winter. Jealous. I finally broke down and turned the heat on today. I might be tempted to bring more in if I had a light bright basement like yours but mine is currently cold and dark and full of things I'm afraid to look behind :). What do you use to treat for bugs? Inspection doesn't seem to be enough for me. They hide in soil and parts of pots I can't see. Yikes. You paint a scary picture. I only treat for mealy bugs. I used nasty granules in the summertime, ones that needed to be watered in. For this move all I do is spray with a mix of isopropyl alcohol, soap, and water... and that's just when I see the creatures and can hit them directly. Looking forward to your post on transforming your pavilion to a winter greenhouse. I have a grape arbor that I'd like to transform to use in the great migration. I think we might be doing that this weekend...so, pictures soonish! It's amazing how much the plants grow on their summer vacation outside. This time of year makes me want to give away some of my tender plants but nobody else wants them in the fall either. Exciting news about your basement 1/2 bath & hope it gets finished in time to bring more plants inside! My migration has also begun. Crazy to think of all the work we do just to enjoy plants that would be perfectly happy growing in the ground in California. Oh, my, what a brood you have - a lot of work to do, hats off to you! I'm in exactly the same mode you are... winterization. And I've got way too many plants. Peter Outlaw is right... you can't give your tender succulents away now because nobody wants them! Like you, I'm finding virtually all of my mealy bugs on some of the agaves I'm bringing in, with a couple of contaminated aeoniums as well. I'm resigned to never getting rid of them. I recently realized that I have never found a mealy bug on any of my Agave Applanata 'Cream Spike' plants, and they are certainly around others that have them. Truly a labor of love! In winter I'm sure you enjoy escaping to your indoor garden. Since I can't be outside as much it certainly does help. As much work as this exercise involves, it seems a great idea to donate time to giving each plant a health exam - and inoculations where appropriate. That's something gardeners in frost-free environments like myself would be smart to emulate. Is it more fun to do laundry during the winter months when you have the company of all those wonderful plants? I'm so impressed with your efforts. If I'm honest with myself, I'm not sure I would have the determination to do all that. As in so many things, you're my idol :-). Is that enough lumens? Are they fluorescent or LED bulbs? I have purchased two steel storage units identical to yours, one with wheels. I am using 10 - 4' light fixtures as it is very bright indeed. Still in process.